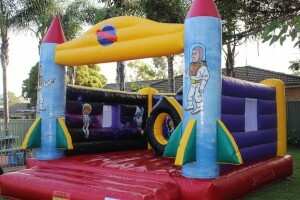 The Rocket Jumping Castle will ensure your party is in a whole other galaxy. Your favourite little astronaut will be impressed with this rocket, as they blast off into space in their party adventures. It measures 4m long, 5m wide and 4m tall. It is completely open, allowing full view for supervising parents and quick access should your little person get upset. The internal poles and holes are a fabulous addition, providing a little more entertainment as kids dodge, hide or cuddle.